This is another brilliant re-issue in Harmonia Mundi's Gold series. The original recording is from 1990, and it remains an absolute gem. 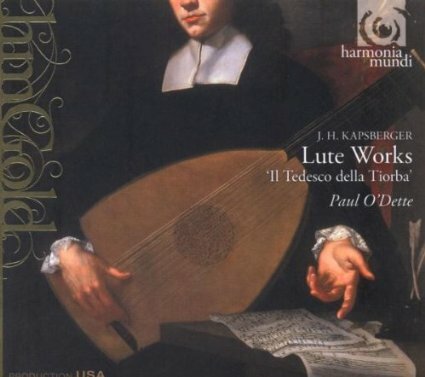 Kapsberger was a lute virtuoso and, as O'Dette says, a "Baroque composer in the true sense of the word," active between about 1600 and 1650. He wrote delightful, original music which deserves to be much better known. Echoes of Dowland are audible in some pieces, while others wouldn't be out of place on a modern pop album. It's wonderful stuff, and Paul O'Dette plays it magnificently. O'Dette is recognised as one of the world's greatest lutenists, if not the greatest, and this disc shows why. He has such a great empathy with the music and plays with such skill and grace that I was instantly seduced the first time I heard the previous release of this CD. He plays some pieces on a 10-course lute and some on a chitarrone (or theorbo), both of which sound simply wonderful - particularly the chittarone, whose deep bass comes across beautifully in the excellent sound recording. I simply don't know how to convey how good I think this disc is. I have listened to mine very regularly for a long time, it still gives me huge pleasure and I still find new things in it. Now it's at budget price it is an unmissable bargain. Recommended in the warmest possible terms.